American Firearms Academy, located in Newark, is New Jersey’s premier SORA (security officer registration act) armed security guard license & training classes. Anyone looking to advance in security or firearms career development, American Firearms Academy has a course for you and offers lifetime assistance in finding employment after certification. 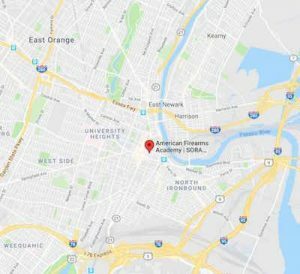 American Firearms Academy will provide licensing, certification, and training for anyone looking to advance in SORA security or firearms career development in Newark, New Jersey. Train to become an ARMED SECURITY GUARD or an UNARMED SECURITY GUARD. Due to the large network of employers we deal with, we are well positioned to assist you in finding employment. Assistance is available for those just starting out or for those with new skills. All of our firearms instructors are certified and licensed with countless hours of experience teaching and handling firearms to all ages, skill levels, and any model guns. Learn from the best to become the best! Please fill out our contact form and one of our staff members with get back to you as soon as possible! “My teacher Douglas Worthen is a great guy, he takes his time to explain about real life situations, and parts of the guns with demonstration. He goes on to fix the problems you have in class. Also, he explains everything clearly and breaks down the parts of different gun types, teaches about all the safety parts, and how to handle and operate a gun. Class is fun and informative!